The woodwinds are the most varied section of the orchestra. Except for the percussion. There, I said it. Of course many will argue with the statement, just as there are always opposing views to every statement. But it’s hard to dispute the wide variety of sounds that the instruments in a woodwind section can produce. Anyone who’s ever listened to classical music probably knows Sergei Prokofiev’s Peter and the Wolf. Written in 1936, it tells the (possibly allegorical) story of a young hero and a wolf. Ultimately, Peter captures the wolf alive and it is taken to a zoo, but only after it menaces a cat and a bird and it swallows a duck whole. Prokofiev scored it for a relatively small orchestra of just four woodwinds, five brass, an array of percussion and strings. 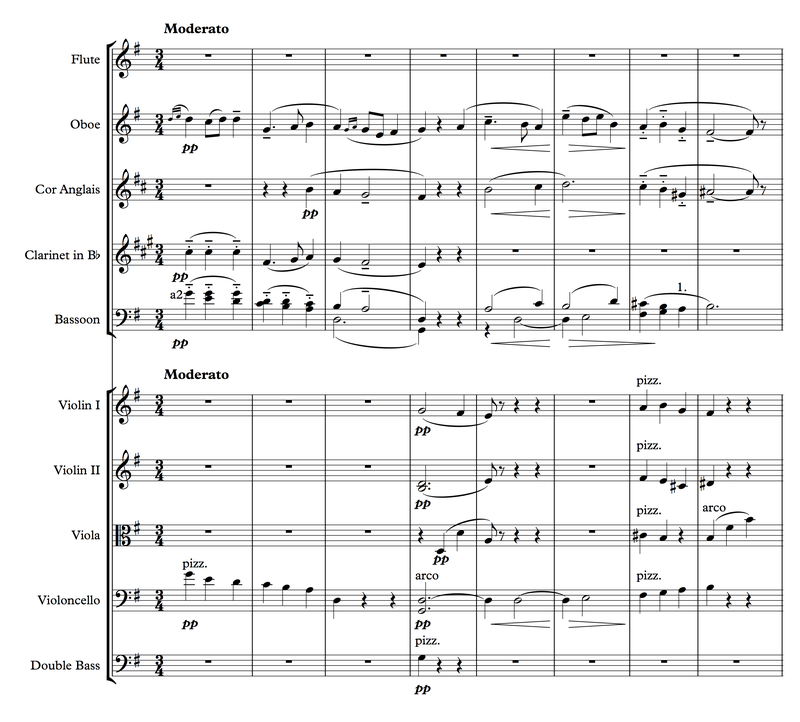 Although there are three different types of brass and all those strings, Prokofiev chose to use the four woodwinds to represent most of the characters in the story. With this post I will begin to examine some passages from works where the composer chose to exploit (and thereby, highlight) the woodwinds. Of course there are lots of solo opportunities in the canon of orchestra music, but the focus here will be on the usage of the woodwinds as an ensemble, often without any involvement from the other sections of the orchestra. My recent series of posts on Kitchen Sink Orchestration explores the large orchestras that began to develop in the later half of the nineteenth century. We tend to think of orchestras of prior times as being a fairly standard group of strings combined with a variety of winds. As true as this might be, the creativity of composers still brought new sounds and new ideas to the audience. Let’s look at one of my favorite concertos of the more than two dozen piano concertos written by Mozart, Number 23 in A major. The score calls for a flute, clarinets and bassoons. Example 56.1 is from the second exposition in the first movement after the second theme is introduced by the piano. The strings have half note legato chords while the piano is playing scalar runs. At the end of the phrase, the piano and strings are tacit and the winds have a brief interlude to themselves. After a couple of measures of piano and strings, a similar pattern returns in the woodwinds, this time with the addition of the flute but with no horns. Click to view full-sized score. This pattern repeats once again and this time all the winds are included. After this phrase ends, the piano introduces a similar pattern, which is then picked up by the strings. In the ensuing measures, the pattern of a quarter note on an off beat (beats two or four of a measure) followed after a leap by a half note is moved around the orchestra. For the first of these phrases (measures 156 through 158), the composer opens with the clarinet hitting the second beat of the measure alone with a one line B and immediately leaping up a fourth to E on the third beat. The pattern of a weak beat quarter note followed by a longer note on the strong beat follows with the introduction of the second clarinet and the bassoons. The two horns are added for a bit of color, with the first horn holding its D (concert B) over to the down beat of the next bar and filling out the triad on that beat. For those who are comfortable writing for winds, this short example is not terribly extraordinary. You can hear similar wind solis in Beethoven, Schubert and many others. Yet, it’s the simplicity and the style that infuse the snippet so effectively into the work. We’ve just heard essentially piano scales for quite a few measures, just with sustained strings in the background. Mozart’s move to add the color of just these three wind instruments is an inspired choice. When the pattern repeats a couple of measures later, Mozart opens it with the flute, the clarinets and bassoons now filling out the harmony, sans horn. On the second repeat of the pattern the composer sweetens the passage with all of his winds, doubling the “melody” in octaves with the flute and first clarinet. It should be noted that this pattern becomes integrated into the work immediately following the wind passage. It begins with the solo piano, then the left hand of the piano enters. A measure later the strings enter on a similar passage and ultimately the woodwinds return to support the busy, delicate and virtuosic work in the piano. It’s interesting to hear how the wind passage begins in tight harmony and — with each iteration — opens up, providing new, if subtle, differences in the sound. This is not, in any way, a primary example of new and innovative writing, certainly not compared to composers of the next century. It is, however, a good place to begin to see how a composer, especially one with limited orchestral means, can still utilize the instruments at his or her disposal to produce a richer palette than might be expected. The composers of the next century — and all that came after, of course — had the advantage of new technology as well as larger numbers of players. The new tech generally consisted of a manufacturer modifying an existing instrument. The alto flute is a good example. To the untrained eye the instrument may even be confused with a standard (soprano) flute, in the same way that a viola might be perceived as a violin if one were not sitting next to it. But it is the new sound of these inventions that provide their compelling tones to the orchestral canvas. An older instrument than the alto flute, and one not even available in Mozart’s day, is the English horn (or cor anglais), although Haydn did score his twenty-second symphony, “The Philosopher” from 1764, for two of them. By a decade or two into the nineteenth century, the instrument was more common in the orchestra. In Example 56.2, you can hear the obvious similarity of double reed tone when the cor anglais is combined with a pair of its higher pitched colleagues. The use of the bassoon here would have been a valid option, but at its high-end, as with most instruments, the bassoon loses much of its unique (and, in this case, woody) character. Instead, the two oboes balance beautifully with the cor anglais playing the bottom of the legato passage. Although this post is focused on the woodwinds, the string writing and the performance are worth noting. When the strings enter just before measure 92, they essentially replay the passage previously performed by the double reeds. 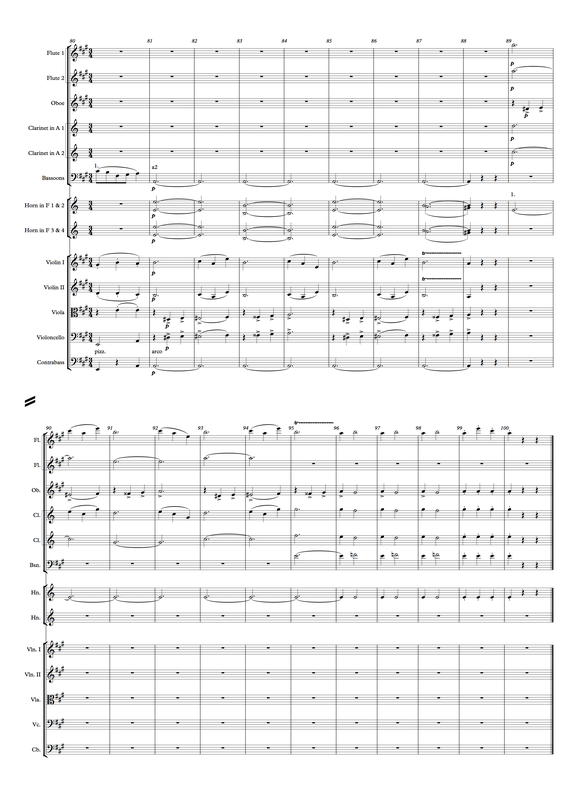 The passage, however, is taken to a higher level of detail and fleshed out with what amounts to four violin parts, two viola parts and two cello parts. It’s in this nuanced performance that the passage just played by the three double reeds is exploded into a sound that is simultaneously a rich and a subtle string sound. Before moving on, it is informative to listen to the line played two octaves apart by the piccolo and the flute in measures 94 and 95. It’s relatively rare to see a flute part highlighted in its bottom end and almost unheard of to have the piccolo double it two octaves higher. The openness of the sound is striking, as is the timbre. To make sure we are aware of this line, Ravel doubles the introduction of each note in the harp. It may not be obvious because of the manner in which the composer moves the notes around, but the line (E-flat, D, C-sharp) is played in three octaves between the two harps while the piccolo and flute sustain the line’s outer voices. Very subtle stuff, but nothing unexpected from this giant in the world of orchestration. Many lovers of classical music have mixed feelings about the composer Pyotr Ilyich Tchaikovsky. In his fifty some years, the Russian master wrote operas, symphonies, concertos and chamber music. Yet, for many he is known just for three ballets: Swan Lake, Sleeping Beauty and The Nutcracker. Among his many gifts, he had the ability to create great and memorable tunes and to introduce them by often unusual groupings in the orchestra. Example 56.3 is the very end of Scene 11 in The Nutcracker, the arrival of Clara and the Prince. Although the music suggests a fanfare that might typically be given to brass, Tchaikovsky chooses instead to have it introduced by the “brassiest” of orchestral woodwinds and then enhanced by the addition of horns and trombones. The trumpets — the instrument most associated with a fanfare — are notably absent from the section. The passage begins with just two oboes but is immediately followed by cor anglais and two clarinets, the two groups exchanging parts for the next three or four measures. And the repeat of the phrase has the oboes and clarinets together, joined by the four horns. On this iteration the bass clarinet, bassoons and trombones play the antiphonal part. It is a wonderful example of wind writing in a less traditional style, specifically because the composer chooses here to omit flutes and trumpets. There are a few additional items of interest here. First, note the great effect the entire string section can have on one isolated pizzicato chord at the down beat of measure 121. In addition to the color it adds, one might imagine the composer thinking that he needs to show his audience how clever he can be writing just for winds so he asks himself: Why not toss in an accented note from the strings? This idea is mostly absurd, because he has none of it on the ensuing downbeat at the silence on the first beat of measure 126. This notable silence leads the way for the woodwinds (again, sans flutes) to be employed for some simultaneous ascending and descending chromatic lines. To spread out the ultimate arrival, Tchaikovsky doubles the length of each chord after the two beat silence at measure 130, momentarily only in the oboes, clarinets and bassoons. I mention this momentary event because of the scoring on the down beat of measure 132: both the upper double reeds and the clarinets are scored the same with the outer voices played by the upper instrument and the middle voice played by the lower one (that is, the oboes and clarinets play the augmented fourth/diminished fifth C – F-sharp and the cor anglais and bass clarinet play the E-flat in the middle). The bassoons are together on the A, the bottom of this diminished seventh chord. Then, the less used of the groups drop out for the 6/4 inversion in measure 134. It’s detailed writing, but it is one of the many things Tchaikovsky did in a noteworthy fashion, expanding the possibilities of orchestration. 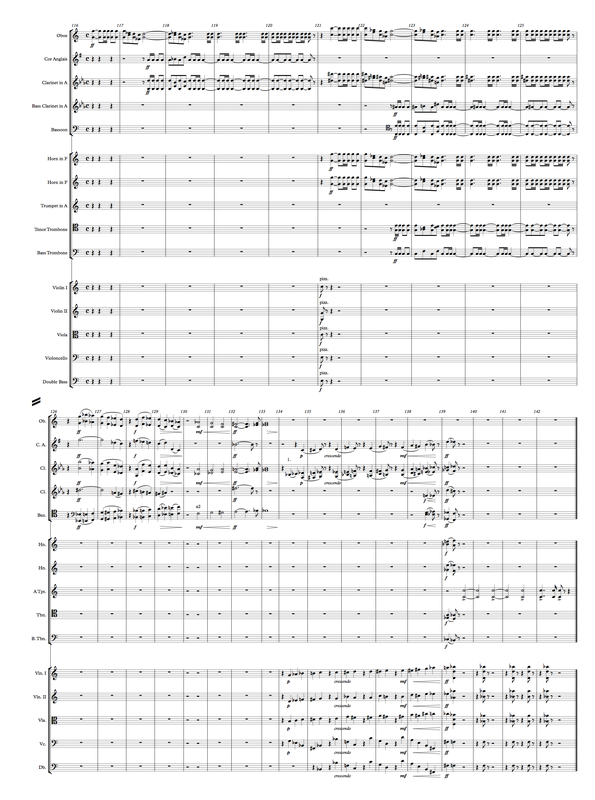 The last part of this passage shows the fun in sustaining a legato line in the cor anglais and clarinets with punctuation by the pizzicato strings. 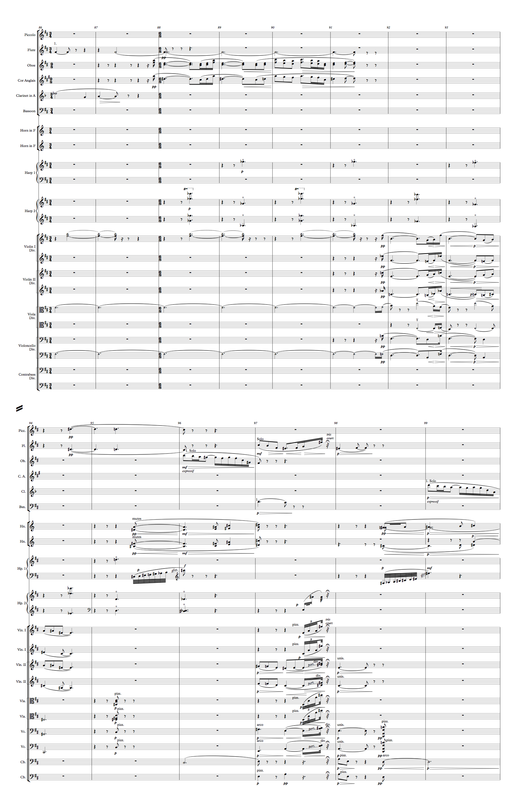 As the snippet crescendos, the bass clarinet and bassoons are added first and then on the downbeat of measure 139 the horns and the trombones join in. After the carefully notated chord on the second beat of the measure, the two trumpets enter on a sustained and accented A on the third beat. The strings play off the trumpets with their B-flat seven chords. It may be a strange way to end the piece, but it’s important to keep in mind that it is just the end of a scene. The “Spanish Dance” immediately follows. 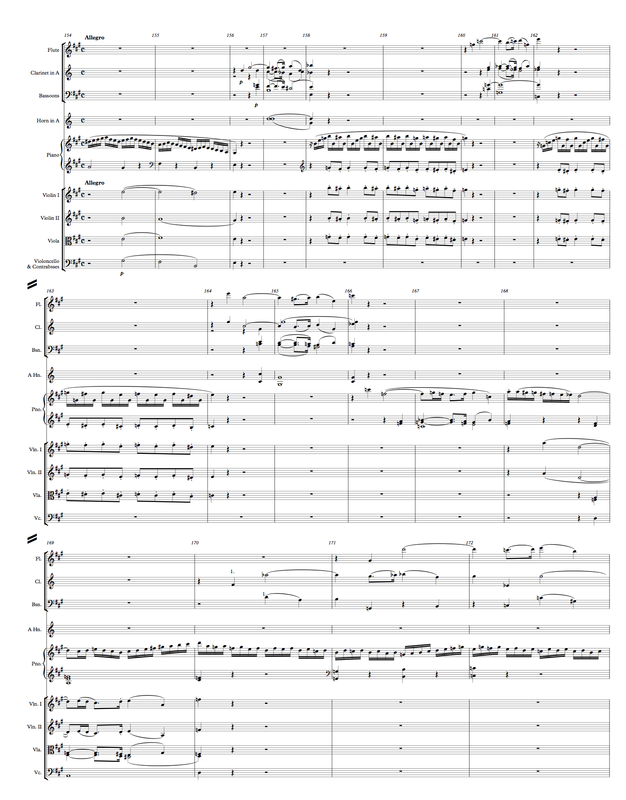 There’s a short passage at the end of the first of “Les dances des cygnes” that is played by the strings with sustained notes by the bassoons and horns. The passage is then repeated by the woodwinds and, as one would expect, the color changes dramatically. Listen to Example 56.4. Note that, for the first half of the woodwind passage, it’s actually just pairs of flutes, oboes and clarinets, with the one horn simply holding the pedal A. One interesting detail is how Tchaikovsky creates this lightness in the winds as it contrasts to the previous passage in the strings. In the first part, the double basses sustain the pedal A, complemented in octaves by the bassoons and, for a while, the horns. Yet, in the wind passage, the composer chooses only to have one horn take the previous role of the basses while the second flute and second clarinet take that of the four horns. This shows how four horns can balance a full string section, while just one flute and a horn are equal to the task with just a few winds. Ultimately as the passage ends — again, only with winds — the chords are played by one flute, one oboe, two clarinets, a bassoon and a horn. These six instruments essentially play the role that dozens of strings, two bassoons and four horns had played just moments before. In fact, they constitute the ensemble known as a Woodwind Quintet, but here with the addition of a second clarinet. This exemplifies the strength of the sound of woodwinds and how they don’t need to play loudly or to be doubled to carry throughout a hall. Often these concepts are overlooked and an orchestration can be overwhelming, simply too much. The winds are not string sections and often need no doubles to have their lines heard. Born into a musical family a generation before Bach and Handel, François Couperin was a court and church composer, writing for among others, harpsichord, organ, violes, and choir. His place as a revered French composer was not lost on later composers, including Ravel. However, the suite Le tombeau de Couperin is at least as much an honor to those who died in World War I and to the Baroque suite as it is to the Couperin. The original suite for piano has six movements. Ravel chose only to orchestrate four of them. The opening of the Menuet, movement 3, is in heard in Example 56.5. The apparent simplicity of the work belies the genius of its craftsmanship. All of the wind parts are scored in comfortable and warm registers. Hear how Ravel begins with a G major triad in close harmony: the fifth in the oboe, the third in the clarinet and the root in the bassoons. As the bass line moves down the score opens a bit and we hear some very comforting block harmonies. The entrance of the cor anglais begins some non-traditional harmonies, at least according to proper traditional voice leading techniques. Nevertheless, it’s these harmonies that make measures 3 and 4 so warm. Note how Ravel keeps the melody in the oboe in thirds with the clarinet, while the double reeds have their thirds lower down. To punctuate the second bassoon line, the composer brings in the pizzicato cellos. As the winds take a brief pause at end of the phrase in measure four, the strings step up to continue the rich harmonies. When the oboe reenters the clarinet drops out and all of the winds are now double reeds. 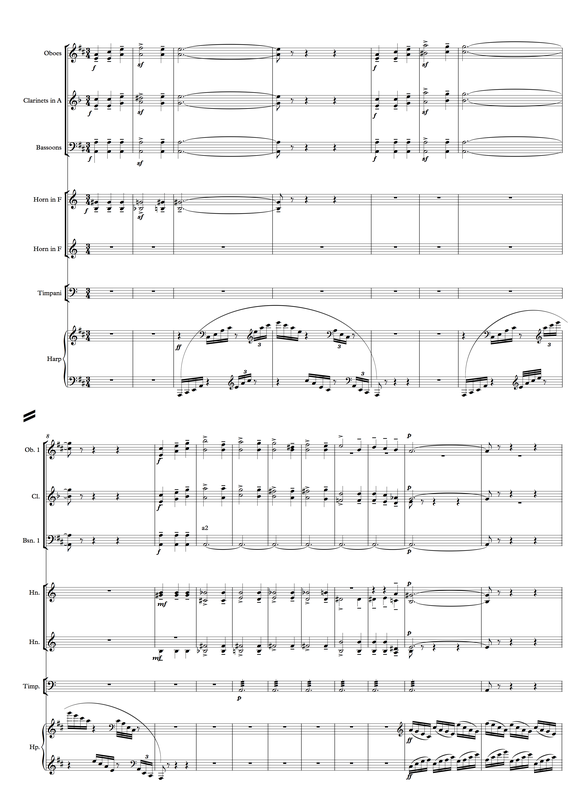 Remember that this work was written a few years after the Daphnis et Chloé ballet (Example 56.2 above) and these double reed passages are certainly familiar to the composer and his audience. To my ear it seems that the addition of the cello line doubling the second bassoon in measures five and six, emphasizing the second beat of the two measures, provides rhythmic impetus and leads to the destination of the B in measure 8. In his magnificent and tuneful ballets, Tchaikovsky wrote some idiomatic parts for winds. At the opening the “Valse des fleurs” from The Nutcracker, we hear only winds and the harp. Although a far cry from the Ravel, Example 56.6 has only the oboes, clarinets, bassoons and horns. The last item I’d like to point out is the use of the timpani to double the pedal in the bassoons. In the previous post entitled Kitchen Sink Orchestration 4 I explained how Strauss uses the bass drum to add to the low rumble of the pedal Cs (Example 55.4). Tchaikovsky here uses the timpani to contribute softly to the pedal. I hope you’ve enjoyed the examples in this article focusing on woodwinds. I will continue this focus in my next post. Please let me know if you have any questions, want to comment on or discuss the material.